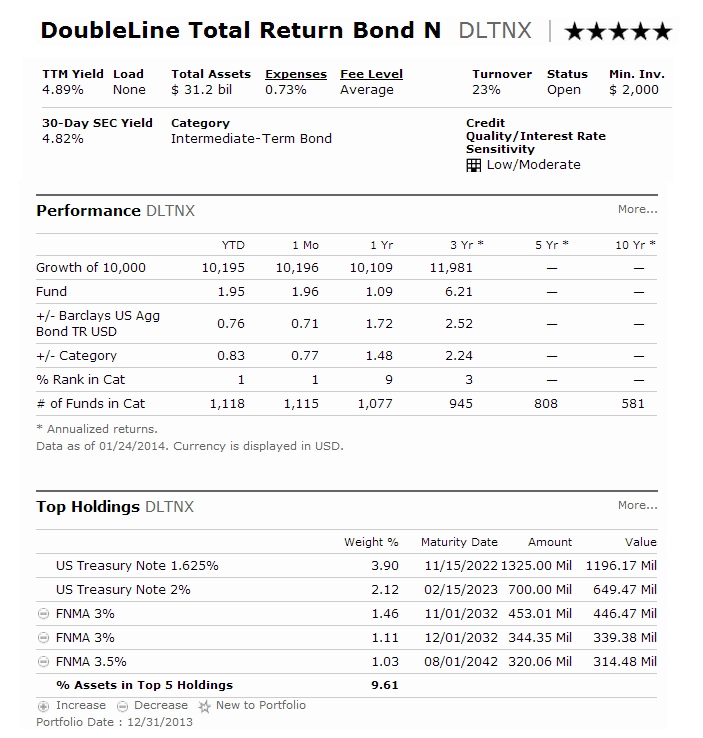 The DoubleLine Total Return Bond Fund is managed by Jeffrey Gundlach and Philip A. Barach. Jeff Gundlach is one of the well-known bond managers. This fund invests mainly in bond, especially in mortgage-backed securities of any maturity or type. The fund’s yield is 5.81%. Its expense ratio is 0.74%. The total assets are $38 billion. This best bond mutual fund 2013 has returned 9% over the past 1 year. In 2012, this fund is ranked in the top 23% in its category, intermediate-term bond. The top 4 bond sectors are Agency MBS Pass-Through (29%), Non-Agency Residential MBS (24%), Agency MBS CMO (18%), and Asset-Backed (4%). Another alternative for this best bond fund is PIMCO Total Return Fund (PTTAX). It is managed by Bill Gross, another great bond manager. This Fidelity New Markets Income Fund is an emerging markets bond fund. With slow growth among the developed countries, the emerging market countries will provide the growth in future. The mutual fund uses its assets to buy debt securities of issuers in emerging markets. It is managed by John H. Carlson since 1995. The 12-month yield is 4.29%. Its expense ratio is 0.86%. The fund’s shares price is $17.83. Vanguard Equity-Income Fund is selected because it provides consistent dividend yield to investors. It also consistently provides higher return than its benchmark. This mutual fund utilizes its assets to purchase common stocks of medium-sized and large companies whose stocks pay above-average dividend income level and have potential for capital growth. The yield is 2.83% per year. It also has a low expense ratio fee of 0.30%. The portfolio turnover rate is 26%. The fund’s shares price is $25.18 (1/20/2013). This best mutual fund for 2013 has a 5-year average return of 5.92%. This stock fund return is beating the S&P 500 total return of 4.62% for the same period. The minimum initial investment is $3,000. Another class of this equity fund is Admiral Shares (VEIRX). This large value mutual fund has below average risk. Morningstar has ranked it with 5 stars and silver rating. As of January 2013, the top 5 stocks in its portfolio are Exxon Mobil Corp, Chevron Corp, Johnson & Johnson, Merck & Co Inc, and Pfizer Inc. The top 2 sectors are consumer staples (15%), and industrials (14%). T. Rowe Price New Horizons Fund is one of the best performing mutual funds in stock category. This 5-star mutual fund has $9.7 billion of assets. This best small growth mutual fund has 0.81% expense ratio. Its objective is to provide long term capital growth through investment in a diversified group of small, emerging growth companies, unknown companies. Henry Ellenbogen is the fund manager since 2010. This best small growth mutual fund has a 3 year annualized return of 19.76%. The best 1 year total return is occurred in 2003 with 49.31%. It is ranked with 5 stars rating. You can buy this equity fund from 100 brokerages for your IRA or regular brokerage. The initial investment requirement is $2,500. As of January 2013, the top 5 stocks in its assets are Catamaran, Clean Harbors, Gartner, Netflix, and Panera Bread. The top 2 sectors are information technology, consumer discretionary, and healthcare. The Vanguard Total International Stock Index Fund is the top index mutual fund. It focuses its investment on companies located in developed and emerging markets, excluding the United States. IT has a dividend yield of 2.92%. This no load mutual fund has low expense ratio of 0.22%. This best international stock mutual fund has returned 18.14% over the past 1 year, 3.90% over the past 3 year, and 9.41% over the past decade. The fund ranking by Morningstar is 4 stars and gold rating. This foreign large blend fund has a 3-year beta risk of 1.01. The other classes of this fund are Admiral shares (VTIAX) and ETF Shares (VXUS). This best mutual fund for 2013 also can be one of the best mutual funds for 2014 hence it is an index fund. As of January 2013, the assets are allocated as follow: 44% in Europe, 24% in Emerging Markets, 24% in Pacific, and 8% in North America. The top 3 stocks are Royal Dutch Shell plc, Nestle SA, and BHP Billiton Ltd. This Harbor Real Return Fund invests mainly in inflation-indexed bonds of varying maturities issued by the U.S. government, non-U.S. governments, and corporations. It is managed by Mihir Worah since 2007. The fund has a similar objective as PIMCO Real Return Fund (PTRNX), but there is no sales load for this mutual fund. It has a 12-month yield of 1.96%. The total assets are $516.4 million. Its expense ratio is only 0.59%. You can buy this top institutional class fund with $1,000 initial funding. Morningstar ranks this best mutual fund with 4 stars and gold rating. It has a 3-year average return of 8.54%. The top 2 bond sectors are U.S. Treasury Inflation Protected bonds (68.01%), and government related bond (14.12%). If you are interested in higher risk, you may choose Tocqueville Gold Fund (TGLDX). This equity precious metals mutual fund invests in equities of companies which produce gold, silver, diamond, and other precious metals. In 2012, this fund has not performing well compare to S&P 500 index, but it is one of a good asset classes to own for long term. This Mairs & Power Balanced Fund is suitable for an investor who only wants to invest in one or two fund(s). It invests mainly in stocks, bonds, and money market fund with moderate risk level. The fund managers are William B. Frels and Ronald L. Kaliebe. It has a yield of 2.70%. Its expense ratio is 0.79% per year. As one of the best mutual funds for 2013, it has a 5 year annualized return of 8.05%. This fund has returned 11.83% over the past 3 year, and 7.53% over the past 15 year. In 2012, the YTD return is 17.34%. Morningstar has ranked it with 5 stars rating. Another great option for balanced fund is Vanguard Star Fund (VGSTX). This Vanguard Star Fund is fund of fund. It has silver rating and great performance over long term period. 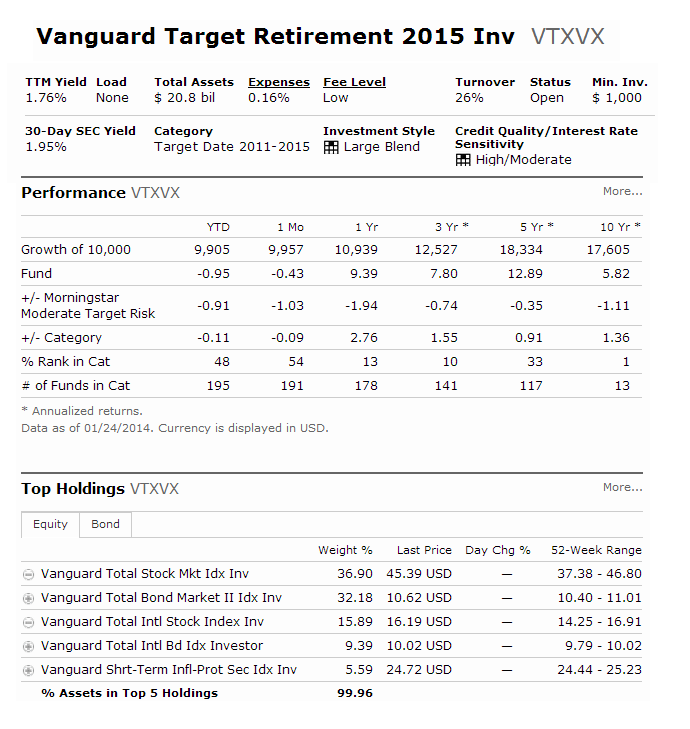 Vanguard Target Retirement 2015 Fund is a one of the top rated target date mutual funds. This fund is suitable for conservative investors and passive investors. It is usually available through 401k, college saving account, retirement account such as Traditional IRA or Roth IRA. It uses its assets to buy other Vanguard mutual funds according to an asset allocation strategy designed for investors planning to retire and leave the work force in or within a few years of 2015. Duane F. Kelly is the fund manager. It has 2.22% yield. The total expense ratio fee is only 0.17%. The fund’s shares price is $13.66 (1/22/2013). Ranked with gold rating, this best performing mutual fund has returned 10.81% over the past year, and 8.52% over the past 3 year. The best 1 year total return was achieved in 2009 with 21.3%. The worst 1 year return was occurred in 2008 with -24.06%. As of January 2013, the top 4 holdings are Vanguard Total Bond Market II Index, Vanguard Total Stock Market Index, Vanguard Total International Stock Index, and Vanguard Inflation-Protected Securities.